PFSP POP TO WIN RECAP! 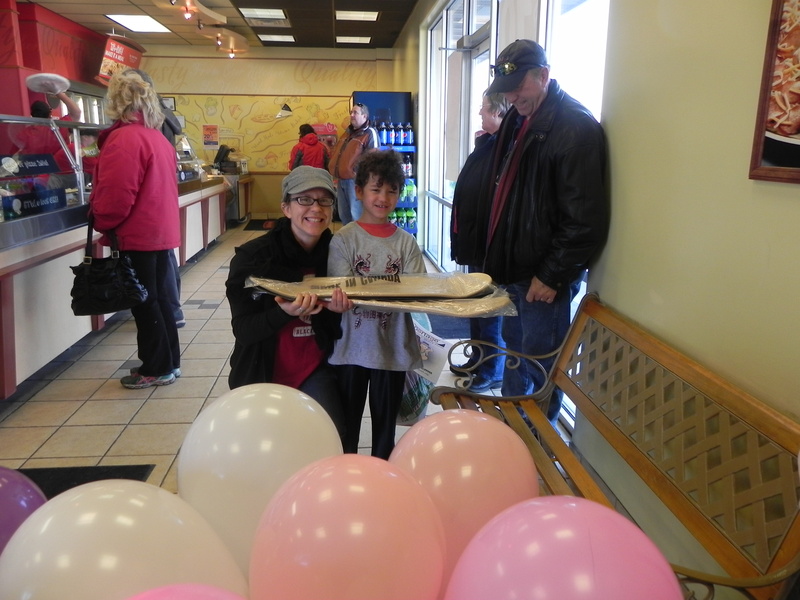 On Saturday Feb 14th the Portage Family Skatepark Project teamed up with Papa Murphy’s in Portage for a Pop to Win fundraiser. Volunteers from the PFSP were taking donations of $5 to pop a balloon for a prize. Quite a number of generous customers donated and took a chance to win our biggest prizes. We had quite a few winners, since every $5 donation won a prize and we raised $200 over the course of the day. Many went home with a box of chocolates, others won PFSP Wristbands, a lucky few even won new skatedecks, but three even luckier individuals Left with our biggest prizes; an overnight stay at the Best Western in Portage, another at the Super 8 in Portage, and a three week membership to the Ridge Gym. First the PFSP would like to thank Papa Murphy’s of Portage for allowing us use of their business for this event. The staff is courteous and Professional, and they always express their support for the Portage Family Skatepark Project. Secondly we must thank the Businesses who donated such amazing prizes for this event. We wish you all a prosperous future in the Portage community. Contributed by: Andrew Tamminga PFSP Art Director. Which one should I pick? That was on everyone mind when it came time to Pop a balloon, at the 2nd fundraiser for the Portage Family Skate Park Project. The Pop to win was held at Papa Murphy’s Portage on Valentines Day Feb. 14th where Papa Murphy’s also Valentine shaped pizza. There was many prizes. Zion Kurtz 8 years from Lodi won two skateboards and grip tape, Debbie Larson Portage an overnight stay at super 8 in Portage, Wisconsin. The other Grand Prize was Doug Iverson who won the 3 month free membership to Ridge Health Gym in Portage. Crystal Kurtz & Zion Kurtz: Skateboard deck winners. Deb Larson: Super 8 overnight Stay winner. Luke Gladen: Skateboard Deck Winner.